I did quite a few prehab exercises before my hip replacement surgery. But, in retrospect, there is one more set of muscles I should have work upon – my lateral groin muscles. The red arrows show where I was exceptionally weak after surgery. So… When Did I Find Out That My Groin Was Really, Really Weak – I found out right away. My right hip had the operation. I left the hospital and, somewhat, easily got into the passenger seat. 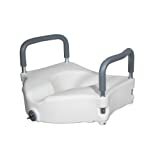 When I arrived home and it was time to get out of the car, I started to slide my right leg sideways – the leg didn’t seem to want to ‘open up.’ I finally got it to the side of the seat and was ready to place my foot onto the ground. Umm, I found I had no strength – my foot, my leg, my hip were in freefall. My wife had to grab my (dainty) foot and support it as I lowered it to the ground. Moving Your Leg Side To Side – Grasping the top of the back of your chair, stand on your good leg, and slowly move your bad leg side to side. Be sure to that your hip, knee and foot are pointing straight forward while maintaining good posture. Be sure to exercise both your good and bad hip. Do sets of 10/20/30 or whatever you are comfortable with. If this is too easy for you, you can add ankle weights until it is a challenge. Using An Elastic Band, Move Your Leg Side To Side – Let the resistance from the band work your inner thigh muscles. Be sure to work both sides. 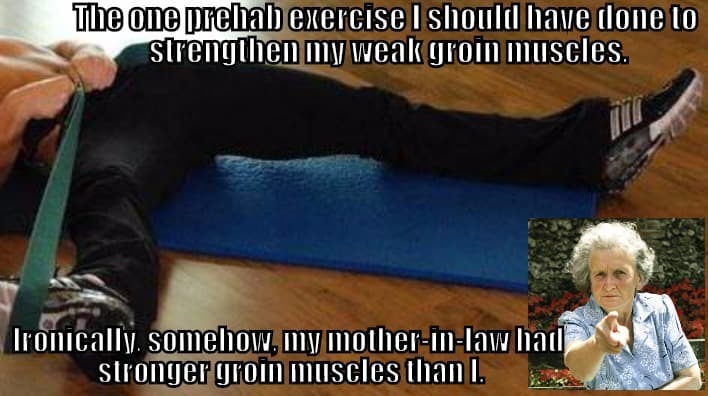 Ironically, somehow, someway, I came to find out that my mother-in-law had stronger groin muscles than I had. It was the only set of real muscles she had. I have no idea how she got her groin muscles so strong. She must have worked that area for years (and years). Chapter 1 – How Do You Mend A Broken Hip? Chapter 3 – What Is The Most Common Post Surgery Symptom? Hmm, Is It Constipation? Chapter 6 – How Do You Know That You Need A Hip Replacement? Chapter 7 – Slice Or Dice: What Are The Nonsurgical Treatment Options For Hip Pain? Chapter 8 – Slice Or Dice: What Are The Surgical Treatment Options For Hip Pain? Chapter 11 – What Questions Should You Ask Your Physician? Chapter 12 – Just How Much Does Hip Replacement Surgery Cost? Chapter 14 – What Are The Surgical Risks A Hip Replacement? Chapter 33 – What Next?